ELEGANCE AND WIT: Former SSU professor David Bromige. Last weekend, I had the opportunity to meet the distinguished Sebastopol poet David Bromige. Now in failing heath, the 75-year-old Bromige taught for more than two decades at Sonoma State University and is a former Sonoma County poet laureate. Bromige maintains a small legion of admirers who value the taut intelligence of his poems. He's routinely described as a "difficult" poet, but I don't buy it. If the standard for transparency is Billy Collins, then maybe Bromige is difficult. Some of his poems experiment with syntax and a fracturing of the language, but these poems are no more difficult to enter, if you let your ear and senses guide you, than most 20th-century chamber music. A typical Bromige poem cracks itself open, as if it were a hairy husk of coconut, and one discovers inside a nutrient composed of logic, wit and irony. Many of his shorter poems are wonders of composition. They often animate the inanimate, and are fired by their own engines, driving straight through the finish with intention. Consider the following two poems, which appear on facing pages in Bromige's volume, Desire. The first, "Abstract," strikes me as a cerebral painting, with a measure of theology tossed in, while the second poem, "The Object," seems like a form of country-western love song. glows from beyond its further side. when I am one with light. of this kind must be distraction. and sets an obstacle between. and say, It once was hers. I last saw you in April '55. in a city where you never were. a girl, unknown to me. I felt dirty when I handled it. Desolate, when I lost it. You meant the world to me. David Bromige grew up in London and leapt the pond to do his undergraduate work at the University of British Columbia. At a legendary poetry festival in Vancouver in 1963, Bromige met a number of American poets, including Robert Creeley, Charles Olson, Allen Ginsberg and Robert Duncan, who would have a huge influence on him. Around this time, Bromige moved to Berkeley, with a Woodrow Wilson Fellowship, to do graduate work. In 1968, Black Sparrow Press brought out his volume The Ends of the Earth, the first of 11 of his books they'd publish over the years. 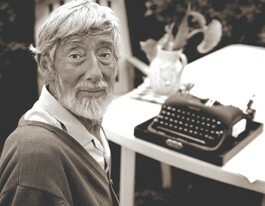 His Black Sparrow volume Desire: Selected Poems 1963–1987, won the Western States Book Award. Bromige has a new Collected Poems coming out in 2010, published by the English press Reality Street Editions. It was an honor to meet Bromige. It's moving to meet a man, a legend of elegance and wit, as he's fading. But he was present. He sat in his wheelchair at the kitchen table. His good friend, Monte Rio poet Pat Nolan was there, as was his wife, Cecelia Belle. When I asked him if he thought his reputation has suffered from living so many years in the provinces, he flashed me an amused smile. From time to time during our conversation, Bromige faded, but he came back wryly, "Did I tell you about my very recent trip to Scotland?"